Box Text: Asterix the feisty little Gaul from ancient France, lays siege to Caesar! Pal Obelix yearns to yank the Empire's tail, too! Straight from the internationally popular comic books, it's action, magic and trickery as the old-world troopers tromp the Roman legions! # Crusade across the Empire as Asterix or his barrel-bodied buddy Obelix. Caesar's salad days are over! # Clobber the Romans with swift fists! Guzzle mystical potions and make magic that always hits the funny bone! # Master 50 zones of mazes, puzzles and comical military might to revenge Asterix's kidnapped pals! 09-14-2018 josepy Box Text Asterix the feisty little Gaul from ancient France, lays siege to Caesar! Pal Obelix yearns to yank the Empire's tail, too! Straight from the internationally popular comic books, it's action, magic and trickery as the old-world troopers tromp the Roman legions! # Crusade across the Empire as Asterix or his barrel-bodied buddy Obelix. Caesar's salad days are over! # Clobber the Romans with swift fists! Guzzle mystical potions and make magic that always hits the funny bone! 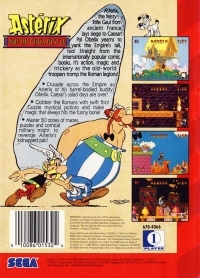 # Master 50 zones of mazes, puzzles and comical military might to revenge Asterix's kidnapped pals! This is a list of VGCollect users who have Astérix and The Great Rescue in their Collection. 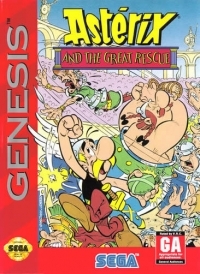 This is a list of VGCollect users who have Astérix and The Great Rescue in their Sell List. This is a list of VGCollect users who have Astérix and The Great Rescue in their Wish List.